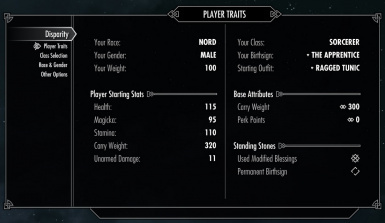 Before selecting a class, make sure you have first chosen your character's race. 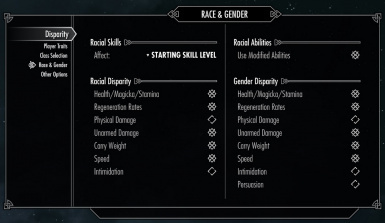 Changing your race after selecting a class will reset your attributes and undo the class changes. 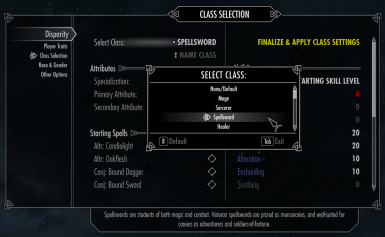 To choose a class for your character, go into Disparity's MCM and select one of the classes from the menu. 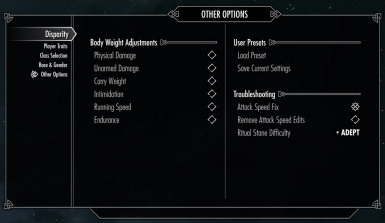 If you don't want to have a class, then simply leave this option as Default/None. Selecting None/Default will set all starting skills to a base level of 15, just like the vanilla game. 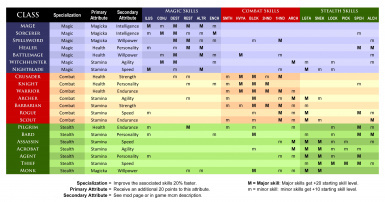 If you choose to select a class, then all of your skills will instead start at level 5, and your chosen class skills will be added to this. 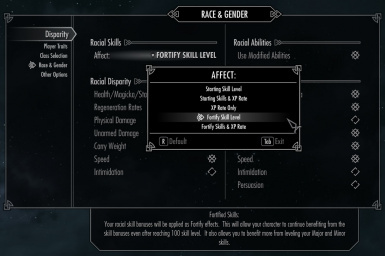 Because Disparity adds the ability to gain increased skill progression through both class and racial skill specializations, I've changed the Mage, Thief, and Warrior blessings to remove the skill progression bonuses. 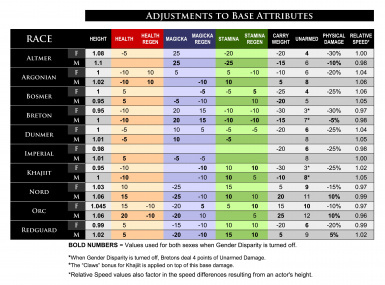 In the process, I've also rebalanced many of the other Standing Stone abilities. I've tried to keep the blessings very lore-friendly and in many cases, I've altered them to be closer to the blessings received in previous games. I've also swapped many of the once-a-day powers for passive abilities or lesser powers.